Hello readers! I’m excited to tell you guys about this because it’s something I’ve been working hard on, as has my mother. She launched a series of books called Real Life Legal™, and they’re like Cliffs Notes or “For Dummies” books on legal matters. And each guide was written by a lawyer who specializes in that area of the law. There are 10 titles in all, including ones on Estate Planning and Planning for a Special Needs Child, but I also wanted to let you know that today, December 3rd, you have the opportunity to download these books for free from Amazon! (Sorry, this freebie deal is over!) They’re a great resource for anyone who wants basic info on a subject without having to pay a lawyer off the bat, and every download helps get eyes on this awesome series. Anyway, since this is a project close to my heart, I wanted to share it with the world! 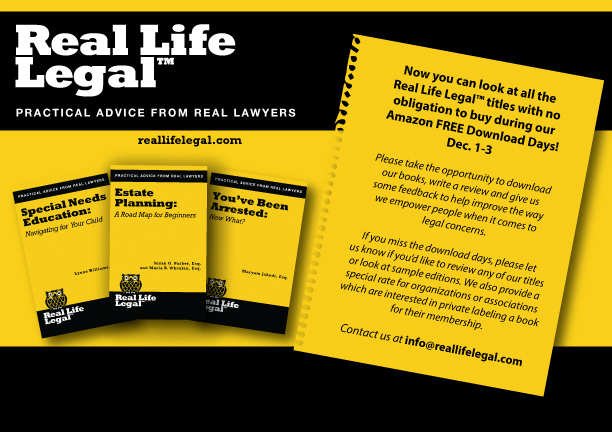 Please take advantage of this offer and help spread the word about Real Life Legal!